Oral History: 1968, 14 pages. Papers: 1955-1978, 28 linear feet. 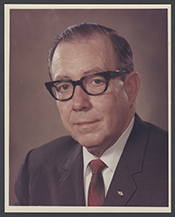 The papers of Paul G. Rogers include legislative files, correspondence, campaign materials, audio and video tapes, speeches, and press releases documenting his congressional service. A finding aid is available in the repository and online.